Welcome to ArkivCentrum in Örebro! ArkivCentrum is situated in the centre of Örebro. In the lobby instructions about how to do research are given by our staff. Our document reading room has 15 seats. Researchers are welcome to use the visitors kitchen to eat their own food. 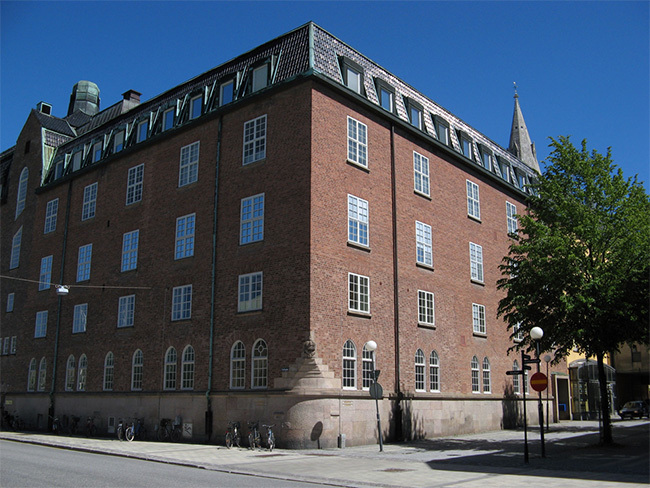 In January 2007 two archival associations joined together to form one organisation in ArkivCentrum Örebro län. The Popular Movements Archives in Örebro County was founded in 1969. Its collecting area was by then limited to the municipality of Örebro, but in 1973 this was extended to include the entire Örebro County. This institutions aim was to document the activities of popular movements and organizations in the County of Örebro, furthermore to stimulate the use of this documentation and to give advice and service in archive matters. The popular Movements Archives also published local historic literature. The Örebro County Business Archives was founded in 1985 (after working within Örebro municipality since 1977), this archive was an association with members from the business community in Örebro County. The main goal was to collect, store and maintain business records and to document business archives and business life in the County. The archives were responsible for the valuable collection of Nora Bergslags Järnväg in Nora. On assignment they arranged and made archival descriptions for the collections of Skyllbergs bruk, Frövifors bruk, Loka brunn and Nitro Nobel AB. The archive also gave advice concerning document handling to several entrepreneurs active within Örebro County. ArkivCentrum's role is to collect and secure the future of records from local bussinesses, unions and various associations in Örebro County. ArkivCentrum hold about 6 km of collections from 4800 organisations and 790 companies in Örebro County. The span of collections regarding organizations is vast, but focus lies on the traditional popular movements. The Business Archives represents most branches and includes collections from the 16th century up until today. There are interesting records from well known mining companies like Striberg, Ställberg, Stripa, Dalkarlsberg and Vieille Montagne as well as documents concerning the manufacturing of iron for example from the iron works of Laxå, Hasselfors, Svartå, Ramshyttan, Stadra, Valåsen, Ölsboda and Villingsberg. Transactions from several older dairies from different parts of Örebro County are held here, also archives from shoe companies in Örebro and Kumla, among them the most well known among them all: Oscaria. Records from several Swedish religious associations and organizations are kept at ArkivCentrum, such as documents from Sveriges Blåbandsförbund, Örebromissionen, Helgelseförbundet and Gideoniterna. ArkivCentrum also keep a comprehensive collection of written memoirs and over 2500 interviews. Among the most interesting business archives are the collections from various iron works. Except for data concerning the manufacturing businesses they often include a great deal of personal information about the workers and their lives. Especially worth mentioning are the archives from Laxå bruk. These documents are valuable seen from many historical aspects, for instance they contain statements about cottages and farms within the parishes in Laxå community. More than 70 % of the Business Archives have been given archival descriptions according to the Swedish general archival description scheme. We have a database with a topographic as well as a systematic registry over the holdings. This information is available in a PDF-file here. There are databases on the collections of the popular movements, such as a registry over associations in Örebro County from the end of the 18th century until today (about 10 400 records). With assistance from archive institutions, both within and outside Örebro County, the Popular Movements Archives in 1994 published a county archive directory with information about more than 11.500 holdings. The directory has three search orders: an alphabetic, a systematic and a topographical. The directory can be ordered from ArkivCentrum. Printed inventory catalogues exist from ten of the eleven municipals of Örebro County and from three parts of Örebro municipality.